Healthy eating is made easy with this delicious dish of pan-fried tofu cooked in a light and savory sauce. 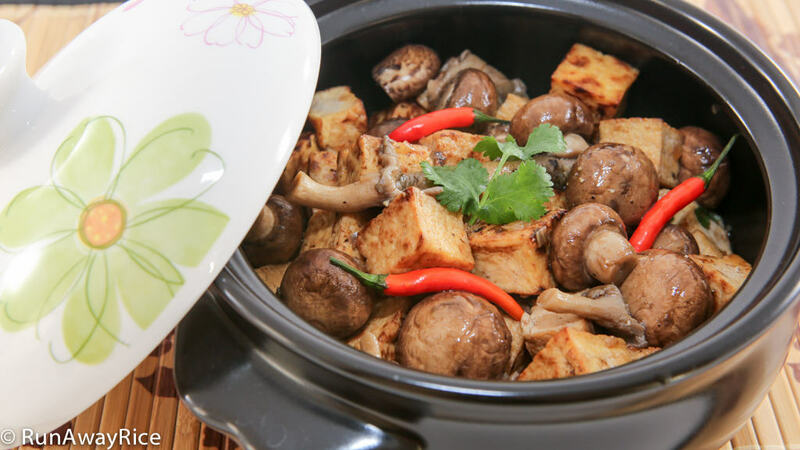 The firm tofu and assorted fresh mushrooms are full of flavor and texture making this dish really hearty and satisfying. Whether you’re a strict vegetarian or like to enjoy an occasional meat-free meal, this is a recipe to bookmark. Enjoy! Firm tofu has a meat-like texture and compliments the mushrooms nicely. If using a softer tofu be gentle when pan-frying and handling so it doesn’t break. Use any type of mushrooms you like in this dish. If fresh mushrooms are difficult to find, the canned ones work well too. In a pinch, I love the canned straw mushrooms. It’s delish! When pan-frying, I like to use an oil spray and mister bottle to coat the pan and the tofu. I can coat the tofu evenly without using a lot of oil. As there’s a lot of tofu in this recipe, you’ll most likely have to pan-fry in 2-3 batches. Leave room in between the tofu pieces to make them easier to rotate them. I like my tofu to have a crispy, golden brown crust. If you want them less crispy, fry just until they are lightly golden. 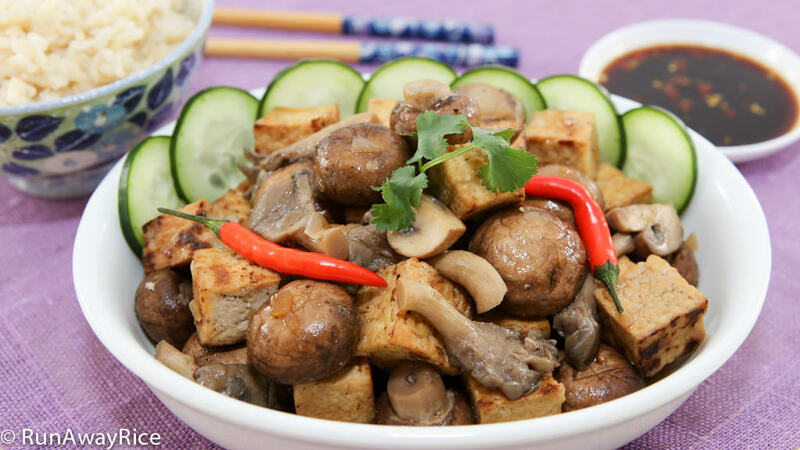 If you enjoyed this recipe, you may also like: Tofu and Eggplant Stir-Fry (Dau Hu Xao Ca Tim) and Sweet and Sour Tofu Stir Fry (Dau Hu Xao Sot Chua Ngot). Remove the tofu from the packaging and gently rinse with cool water. Blot dry using paper towels. Cut the tofu into 3/4-inch cubes. Separate the oyster mushrooms by cutting close to the root. For the Baby Bella mushrooms, trim off the end of the stem. Cut any larger mushrooms in half or quarters. Rinse the mushrooms with cool water two times. Allow to drain while continuing with the next steps. Peel and chop the shallots. Set aside in a small bowl for now. In a measuring cup, add the coconut water, soy sauce and Hoisin sauce. Stir together combining all of the ingredients well. Heat a large skillet over Medium High heat. Coat the skillet with vegetable oil and then quickly add the tofu cubes leaving some room in between each piece. Cook on the first side for 5 minutes or until golden. Lightly coat the tofu with vegetable oil. Flip the tofu onto the next side and cook for a few minutes or until golden. Continue cooking until all sides are golden. Transfer the tofu to a clean plate. Heat the same skillet over Medium heat. Add vegetable oil and the shallots and stir-fry for 15 seconds. Add the mushrooms and saute for 2-3 minutes drawing out the liquid. Increase the heat to High and add the sauce. When the sauce comes to a boil, reduce the heat to Medium and add the tofu. Combine together making sure the tofu is evenly coated with the sauce. Cook for 5 more minutes combining occasionally. During this time some of the liquid evaporates and the sauce will thicken. Add freshly ground black pepper. Chuc mung nam moi! This is exactly what I had in mind when planning this recipe. We all indulge during Tet and now it’s time to get back to basics 🙂 Hope you enjoy the recipe!